The Manchester PAT training course will take its trainees through the whole process that is required for qualification, using both practical and theoretical methods. At the end of the course the participant will leave with a Certificate of Competence, and enough knowledge and practical skills to begin working in the business as a professional PAT technician. As well as covering all of the practical elements that are needed, the course allows learners to practise the techniques under the supervision of a working professional. The theoretical elements of the course that are taught include: the classification of appliances, test procedures, visual inspection, testing instruments, the IEE Code of Practice, record keeping and how to use a PAT tester. In addition, the course will provide all learners with the Handbook of Portable Appliance Testing, morning tea, a buffet lunch and a PAT reference card. To complete the training every learner will have to sit a 20-question exam. 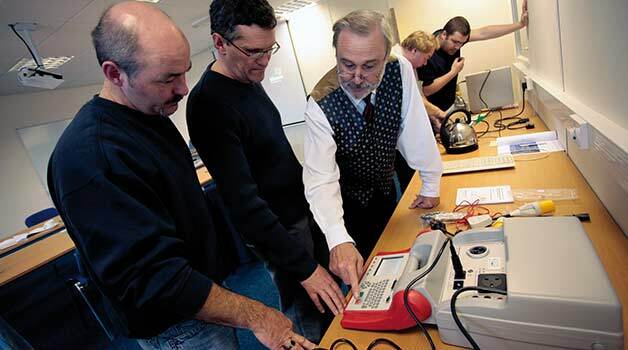 This is a theoretical examination that will ensure that each trainee understands the PAT testing process in full. Practical exercises will also be carried out and monitored by a working professional. After successfully completing these tests the participant will be awarded the Certificate of Competence, which will allow them to practise legally. Manchester PAT training lasts one day and takes place between 9am and 4pm. This course is suitable for individuals looking to start PAT testing and businesses who want to test their own appliances. No experience or formal qualifications are required for this course. It is recommended that learners purchase and study a copy of the IEE Code of Practice, this will ensure a deeper understanding of the subject. The tutors delivering PAT training in Manchester ensure that participants gain all of the skills necessary to begin working in the industry at a professional level.